At this time of year, people are inclined think ahead to longer, brighter days and possible trips abroad. The Diocesan pilgrimage to Lourdes offers a break with a difference; a change of air and a space for prayer. Elphin becomes a community on the move. The annual Diocesan pilgrimage will take place from 30th August – 4th September. 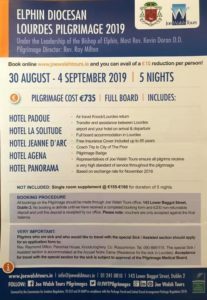 Please note that if you require assistance on this pilgrimage, you should contact the Pilgrimage Director, Fr Ray Milton, directly on 090 6661115. Acceptance for travel with the special section for the sick is subject to approval of the Pilgrimage Medical Board.